"Our lives begin to end the day we become silent about things that matter." - said Martin Luther King. This quote was the basis of this morning's preaching, December 28, 2017, at the Catholic parish of my neighborhood in Kinshasa, DRC. This preaching has invited Congolese to be Christians with light in their actions that reflect the teachings of Jesus-Christ. "Mo Kristo azali mwinda": A Christian is a light. The salubrity that characterizes many cities in the DRC, particularly Kinshasa, is a sign of willful blindness or self delusion that the Congolese people are in ignorance while languishing in misery. It was pointed out that the humanitarian and socio-economic situation in the DRC is dramatic and is getting worse all over the DRC. Ignorance, poverty, malnutrition, infectious diseases such as cholera and others are raging in the DRC while bad governance, violence, corruption, salubrity, ignorance, moral depravity, mediocrity and injustice are ruling the country. Any religion that is unable to respond to the socio-economic and political problems of a society, in which it lives, has no reason for existence. It is therefore essential that Christians receive training on constructive social doctrine of Christianity, to be able to act and live in the world according to the evangelical values. The Catholic Church has therefore constantly reminded Christians in texts or speeches that are not often unambiguous, but at least have the merit of being clear, the injunction made to Christians to feel concerned by policies /politics. If you do not take care of politics, politics will take care of you. What is observed is that many Christians are sensitive to the shadows and burden of political action. But those who suspect the politics of infamy often have a short idea. In reality, regardless of its frivolities, its failures and its corruptions, political action has a formidable stake: to tend towards a society in which each human being would recognize in any other human his brother or sister and would treat him or her as equal and with love. 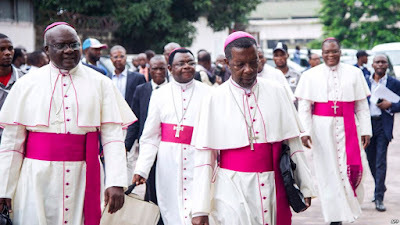 Thus, every Congolese Christian should feel concerned by politics in the DRC. Whenever he/she can, they are called to be active citizen always taking care to minimize the results of their action. In today's society, there are several places where the future of humans is determined. We can act individually or collectively at the level of a family, a company, a region, an association, a neighborhood, a political party, a government, a country etc. The wider is the field of political action, the more Christians are demanded to demonstrate thoughtful commitment. Indeed, it is the entire daily life (work, nutrition, housing, health, education, leisure etc.) of each human that depends on economic, cultural and state political decisions. Political choices do not only have immediate effects but also long-term ones, they also engage future generations. All Congolese Christians have therefore been invited to commit for change and freedom in the DRC, a country that is being held hostage by a minority of people who are enriching themselves and exploiting the majority who are languishing in the most abject misery as well as in a dehumanizing insecurity. A vibrant tribute was paid to all victims and survivors of exploitation and violence in the DRC. The Congolese laity urged the DRC populations to overcome fear and take their responsibility by mobilizing for the 31st December 2017 Christians march in solidarity to claim their rights as well as to act individually and collectively to emit a Christian light in the DRC. Congolese must no longer be silent about things that matter. A human being who adheres to Christian values as taught by Jesus-Christ, which are fundamental and universal.